It was the type of storm usually reserved for a late afternoon in Savannah, with streets flooded a good 2-3 feet. But today it came at 8:45 AM, the heart of morning rush. I half expected to pontoon boats or pirate ships, before I even got my morning caffeine jolt. My journalistic instincts were not in effect as I had two kids in the car and a tank dangerously close to empty. 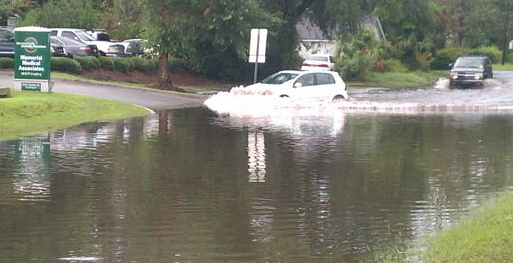 I was just hoping I wasn't going to be one of those poor bastards stuck in their car, so the photo is courtesy WTOC. I'm not an idiot driving in poor conditions having grown up in the northeast, gone to college in Syracuse, and living several years in Nebraska and Michigan. But how to drive in a flash flood is something you just need to learn from your experiences. 1. Drive with two wheels on the sidewalk or raised median for better traction. 2. Get behind a big truck. It's kind of like drafting in auto racing. They'll "part the sea" for you a bit and the water won't be nearly as high in its footprint. 3. Don't drive too slow. Without some momentum, you might not be able to make it through the high water and might find yourself mired. Everything worked out fine. The kids thought it was an amusement park ride. The Nissan Murano was a trooper. And I am ready for my boating license. Can This Teenager Save Penn State Football? Baracking Bad Part 2: What Will 51 Bring? Baracking Bad Part 1: What Will 51 Bring?